Aug. 24, 2015 + + + As mutually announced by both companies, the Stauff Group has successfully completed the acquisition of the Meinerzhagen, Germany based company Voswinkel from the Voswinkel shareholder family in April this year already. With corporate headquarters in Werdohl, Germany and two additional plants in Plettenberg-Ohle and Neuenrade-Küntrop, the STAUFF Group develops, manufactures and distributes pipework equipment and hydraulic components for mechanical and plant construction as well as for industrial service and preventive maintenance. The company is supported by wholly-owned manufacturing, sales and service facilities in currently 18 countries worldwide and a tight network of authorised distributors and representatives in all major industrial regions of the world. Voswinkel is considered to be one of the world's five largest producers of quick release couplings for hydraulic systems. The traditional German company, founded in Kierspe-Rönsahl in 1928, also develops and produces a comprehensive range of hydraulic hose fittings – particularly for high-pressure applications – as well as custom-designed piping from its two sites in Meinerzhagen. Voswinkel equipment is primarily used for construction and agricultural machinery as well as for commercial vehicles. 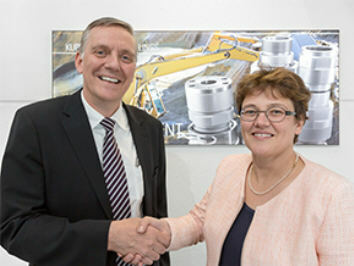 Pooling both companies' business activities and merging the product ranges creates the opportunity of offering distributors, original equipments manufacturers and other customers in Germany and abroad an increasingly complete package of pipework components for fluid power applications from a single source, thereby strengthening both companies' positions in the market in the long term. Without this cooperation with Stauff, Voswinkel would have had to press ahead with its own internationalisation in the medium term with costly expansion, but now has immediate access to Stauff's global network for the distribution of its own products and solutions. This network includes subsidiaries in Europe, North and South America, Australia as well as in core growth markets, such as Russia, China and South-East Asia. Both companies are already cooperating very successfully in some of these markets. Voswinkel will remain an independent company within the strong Stauff Group and will retain its character as a medium-sized company led by Mrs Claudia Voswinkel- Schöpp, Chairwoman of the Executive Management Board, Mr Heinz-Werner Störmer and Mr Georg Weiland. Independence in this context also means that Voswinkel will continue to operate under its corporate name, which has been a well-known and established brand name in the industry for many decades, and is regarded as being synonymous with quality and innovation. A location guarantee has also been given to retain the two Meinerzhagen "Neugrünenthal" and "Auf der Koppel" sites of Voswinkel.